Chevrolet has announced pricing for the Colorado ZR2 Bison. Designed in collaboration with AEV, the Bison takes the most capable truck in it’s class and adds even more off-road capability. For more information about Colordaro ZR2 pricing, check out this article from AutoBlog. The patience of AEV customers was rewarded at the recent SEMA show when the company provided a first look at several parts for the new Jeep JL Wrangler. While some of the new products shown at the massive SEMA Show in early November are still in the prototype phase and may change slightly before they are released, from late 2018 into 2019. Don’t worry, AEV’s future product line for the JL Wrangler will not be limited to just the products that were shown at SEMA either. They have been working on a number of other parts and accessories that are still in the early stages of development at this time. AEV is extremely appreciative of and humbled by JL owners clamoring for its new JL content and the time invested in OE-level design, tooling, engineering, and testing of all products before release will ultimately reward customers for their patience. In addition to the JL Wranglers, AEV showed a customized version of the all-new Chevy Colorado ZR2 Bison, which features several factory-installed parts manufactured in a first-of-its-kind collaboration between an OEM and an aftermarket supplier (Chevy/AEV). AEV plans to produce a number of additional components for Bison, available directly from AEV and its Authorized Dealer network, beginning in 2019. AEV’s Bison vehicle at SEMA featured many products that it will market to Colorado’s Z71, ZR2, and Bison models. AEV also used the SEMA show to demonstrate its continued dedication to the latest and greatest in manufacturing technology. In addition to parts that display AEV’s distinctive knack for great design, scale and fitment, the custom JL and Bison vehicles shown feature several components made of Hot Stamped Boron Steel—the first products built with this material anywhere in the Jeep aftermarket. AEV is utilizing this ultra-high-strength steel for the Bison Skid Plate System and on the Modular Front Bumper for the JL Wrangler. The material allows for a significant reduction in weight while exponentially increasing strength and durability. In 2018, Chevrolet announced production plans for its Colorado ZR2 Bison mid-sized pickup, expected to be in dealer showrooms in January 2019. The Bison will be the most off-road capable truck in its class and will feature several factory-installed components co-produced by Chevy and AEV. This most extreme Colorado yet pushes the boundaries of Chevrolet off-road ability with features that optimize the rock crawling and overlanding capabilities already present on the Z71 and ZR2 models. For maximum protection of key undercarriage elements while driving over rocky, jagged terrain, Bison features five skid plates that cover the engine oil pan, fuel tank, transfer case and both front and rear locking differentials. Designed by AEV, these skid plates also offer another rarity for a production vehicle in that they are constructed of hot-stamped Boron steel, a cutting edge material that increases strength and durability while reducing weight. That focus on off-road protection also extends to the AEV-designed stamped steel front and rear bumpers, which offer excellent protection while traversing obstacles like rocks and logs. Trail recovery is another key component of these bumpers, with the front featuring winch provisions and recovery points integrated into the rear. Bison also features standard fog lights below the traditional headlights. The 31-inch Goodyear Wrangler Duratrac off-road tires wrap all-new, ZR2 Bison-specific 17x 8 inch aluminum wheels. The truck comes standard with an all-terrain ZR2 Bison spare tire and special larger ZR2 Bison fender flares. The Bison-specific wheels and fender flares were also co-developed by AEV. In addition to the AEV/Chevy collaborative components available on the stock Bison, AEV will also offer multiple Colorado-specific parts for Z71, ZR2, and ZR2 Bison models beginning in January, 2019 and in the months and years ahead. Introducing the Chevrolet ZR2 Bison, the most capable off-road truck in its class meets the most innovative manufacturer in the aftermarket. The ZR2 Bison was a co-development project between Chevrolet and American Expedition Vehicles (AEV). Bison marks the first occasion that AEV has collaborated with any OE manufacturer on a production vehicle of this magnitude. The Colorado ZR2 Bison joins Chevrolet’s segment-redefining midsize truck lineup as an all-new performance variant. Colorado’s constant innovation – including a segment-exclusive diesel engine (excludes other GM vehicles), a new V6 gas engine and 8-speed transmission combo only two years into production, and the ZR2 performance variant – has allowed Chevy to carve out more than a quarter of the midsize truck segment in less than four years in the marketplace. With the help of several key integrated AEV components, this most extreme Colorado yet pushes the boundaries of Chevrolet off-road ability with features that optimize the rock crawling and overlanding capabilities already present on the Z71 and ZR2 models. Designed by AEV, these skid plates also offer another rarity for a production vehicle in that they are constructed of hot-stamped Boron steel. The 2019 Colorado ZR2 Bison goes on sale in January, 2019 – modified for extreme off-road use and backed by a full factory limited warranty. The Bison is also distinguished by an exclusive, flow-through “CHEVROLET” lettered grille replacing the traditional bow-tie. The 31-inch Goodyear Wrangler Duratrac off-road tires wrap all-new, ZR2 Bison-specific 17x 8 inch aluminum wheels. The truck comes standard with an all-terrain ZR2 Bison spare tire and special larger ZR2 Bison fender flares. 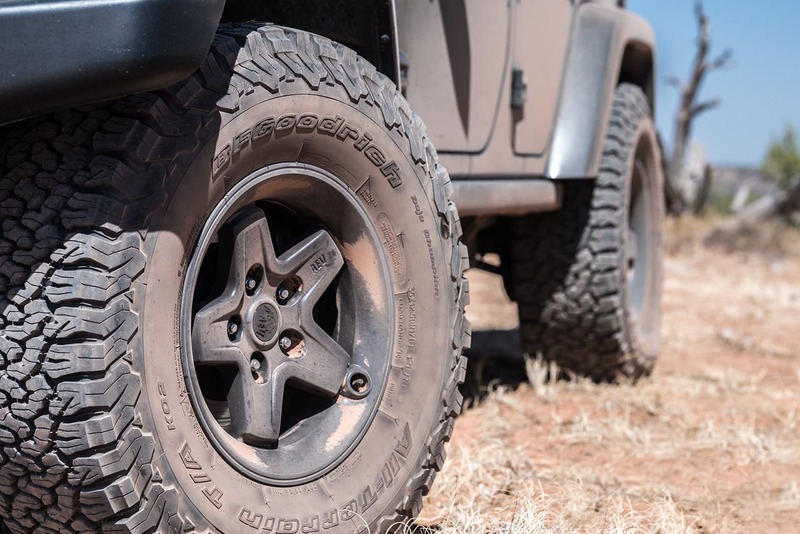 The Bison-specific wheels and fender flares were also co-developed by AEV. This new Colorado variant also features “Bison” decals on the bed sides, an “AEV Bison” logo on the tailgate and embroidered AEV-logo floor liners and headrests. Customers will also be able to purchase an accessory snorkel for ZR2 Bison from AEV, ideal for air filtration while driving on dusty trails. This feature is available for all Colorado pickups. Winch-compatible, stamped-steel Front Bumper with integrated fog lights. Five hot-stamped Boron steel underbody skid plates protecting the front end, engine oil pan, transfer case, gas tank, and rear differential. Stamped-steel Rear Bumper with robust A356-T6 cast-aluminum recovery points and chassis-mounted tubular corner protection. Bison-specific injection molded fender flares for additional tire coverage and an aggressive look. Interior and exterior AEV branding package. Optional AEV snorkel available directly from AEV or GM dealerships. The ZR2 Bison also duplicates the full equipment list of the Colorado ZR2. Among 4WD enthusiasts, Utah is known worldwide as the home of Moab and the Easter Jeep Safari. Each year the famous Easter Jeep Safari attracts thousands of 4WD enthusiasts who come down to enjoy Moab’s legendary slickrock landscapes. However, it turns out that Moab’s landscapes are just a fraction of what Utah has to offer and for 4WD enthusiasts who want to see just how diverse and amazing this state really is, the Utah Back Country Discovery Route offers a front row seat. The Utah Back Country Discovery Route (UTBDR) is a 4WD track that stretches roughly 900 miles across Utah – from the border of Arizona to the border of Idaho. Along the way it passes through some of Utah’s most stunning locations including the Valley of the Gods, Lockhart Basin, San Rafael Swell and the Uintas Mountains. During the month of July, AEV’s Chris Wood guided a team of AEV friends across the UTBDR – over which they traveled self-contained, camped remotely each night and ultimately completed the route in nine days. We hope you will be inspired by Chris’ photos from the trip and consider running the UTBDR yourself. How long must we wait for AEV parts for JL Wrangler? We’ve been hearing it ever since the first Jeep Wrangler JL models began rolling off the line in Toledo in late 2017: When will we see the new JL accessories from AEV? Our answer? Soon! But not until they are perfect! At AEV, patience is not just a virtue—it’s a necessity. Sure, it’s frustrating to see that many competitors have already rushed to market with accessory parts for the JL. But AEV did not make its name as the world’s premier Wrangler accessory manufacturer by rushing things. Our approach to developing JL parts will be the same that made our JK products so successful. We will be methodical, detailed, and patient. Because we want to get things exactly right again. AEV purchased several JL Wranglers as soon as they became available, and our design team and engineering staff immediately began dismantling and modeling every inch of the vehicle. Virtually the entire vehicle has been mapped and converted to data for our state-of-the-art Computer Aided Design (CAD) system. In CAD our designers are free to bring full creative license to the new JL bumpers, hoods, skid plates (and other undercarriage protection), wheels, and more that we will ultimately build. Engineers can test feasibility before money is invested in expensive tooling, and before a part is ever stamped and placed on a Jeep. And while this OE approach to manufacturing slows development time at the start, it definitely means we will have ingeniously designed, longer lasting, and more durable parts when they do come to market. So AEV asks its loyal customers for a bit more patience. Quality takes time, and AEV never sacrifices quality. But what we can tell you now is that we are revamping every product in our JK line for the new JL Wrangler, and we are developing several new products that we’ve never done before. The look will be all new, and the quality, fit, performance, and durability will be even better. At first glance, the JL Wrangler does not appear to be much of a departure from the JK. But upon closer inspection we can see significant differences and/or improvement. For one, the JL has a wider variety of trim levels and available configurations with different flares, grilles, and hoods. This will challenge us a manufacturer to develop bumpers for all of these permutations. Additionally, the tailgate and tire carrier on JL are significantly different, and while the suspension system looks similar it is actually totally different. For one, the handling is tremendous, with a super tight steering radius on the four-door JL that turns like a much shorter wheelbase two-door Jeep. AEV has already spent months developing our trademark custom-tuned springs and shocks and, as of mid-2018, is just beginning to build suspension prototypes for extensive testing. And on the subject of testing—AEV insists on exhaustive testing on all products—another necessity that slows the path to market. AEV performs OE-level stability control testing and corrosion testing. There is even thermal testing to see how temperature expands and contracts plastic and metal parts. The average test takes 16 weeks, and if results are not optimal the product goes back to the drawing board. So, will AEV ever be first to market? No. Not if we’re doing it right. In mid-2018 there are already companies selling JK bumpers to JL owners, or marketing roughed-out suspensions. AEV believes that patience in the short-term results in the ultimate long-term goal—extremely well-conceived JL components made in the USA using world-class automotive technology, manufacturing, and materials. So we ask you to hold on a little longer. AEV is coming very soon with all the goods for JL Wrangler! Expect to see our first JL Wrangler parts at SEMA 2018! Moab, Utah is a mecca for off-road enthusiasts, with dozens of challenging red rock trails through some of the most breathtaking country in the world. Red Rock 4-Wheelers of Moab organized the 52nd annual Easter Jeep Safari, attended by thousands of wheelers from across North America. Of course AEV was there with several vehicles and employees. EJS is a great time to meet with customers and hear their ideas for new products and for improving current products, and for testing products in development. But we’ll admit—mostly we just love driving great vehicles on fantastic terrain as much as anyone else. We learned a lot, and had a great time doing it, as we do every year. Every year at Easter Jeep Safari AEV hosts its Customer Ride, a pre-registered event that allows us to show appreciation to the customers we serve. In all 20 vehicles traversed the Strike Ravine Trail as AEV’s Chris Wood, a certified master instructor with the International 4WD Trainers Association, occasionally took time to stop our party and demonstrate proper technique for surmounting some of the more challenging obstacles. The 11 mile trail took much of the day to complete with a stop for a scenic lunch included. AEV customers interested in signing up for the 2019 Customer Ride should contact their AEV sales representative. While our team was based in Moab for the week, Chris Wood and a few others broke out to nearby Lockhart Basin for a couple of days to field test AEV’s upcoming High Capacity DualSport Suspension system. The lightly used trail includes everything from unmaintained roads to technical rock crawling as well as offering some epic camp sites. The trip was also a scouting mission for Backcountry Discovery Routes (BDR), which seeks to establish and preserve off-highway routes for 4 x 4 vehicles and adventure motorcycles. From the looks of these fantastic images, it appears the guys discovered some amazing country in Lockhart Basin. CATCHING UP WITH BF GOODRICH! AEV is grateful to have a close working partnership with BF Goodrich Tires. 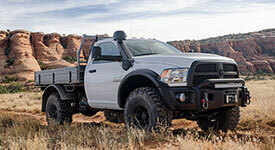 In fact BF Goodrich tires are standard on all AEV upfit packages for Jeep Wrangler and Ram trucks. In 2017 BFG sent us a set of their unreleased Mud-Terrain KM3 tires for testing and feedback. Since then AEV has put 12,000 miles on the KM3s and we’ve been impressed with how well they have performed in severe weather conditions, on the highway, and in a variety of challenging off-road terrains. All week in Moab, wheelers definitely took notice of the new tires on AEV vehicles, and we anxiously await the release of the new KM3s to market. Rather than standing under a tent and passing out brochures, each day at Moab AEV’s vehicles were on the trails. AEV likes to get out where rubber meets the rock and feel the sport of off-road wheeling. We like to meet our customers and potential customers where they are most at home—where we can stay in touch with their passion for the sport, hear their concerns, and also display the true capability of AEV vehicles on some of the most demanding off-road courses in North America. The Easter Jeep Safari is one of the most important events on our calendar, and one we look forward to each year!